How long did that rush last? Did it keep you happy? Peaceful? Contented? Twenty-four hours later? Forty-eight? A week? A month? I know. You don’t really have to tell me the answer. Not even the most glorious earthly moments fill us up for long. It feels great when someone praises us. But that feeling is soon gone, replaced by whatever frustrations of the day crowd it out. The happy moments that circumstances here can offer us are fleeting, ephemeral. We can spend our entire lives chasing after the next one, feeling empty in all the long drawn out moments in between. Or we can pay attention to Psalm 65:4. Take a moment. Read it again (above), slowly, carefully. Daddy God is holding out for us exactly what it is that will provide for us true, lasting satisfaction. Joy that doesn’t fade away like the smoke hanging in the air after the fireworks display. His house. His holiness. These are what will genuinely, permanently satisfy our parched souls. “Blessed is the one you choose and bring near, to dwell in your courts!” Blessed! Joyful! Overflowing! Contented! Satisfied! This is the condition of an individual who learns to dwell in the Lord’s courts; in His presence. Truly fulfilled is the one who lives this earthly life centered in the Lord’s abiding closeness. Jesus also expressed it this way: “Whoever drinks of the water that I will give him will never be thirsty forever” (John 4:14, ESV*). My dear friend, did you hear that? Really hear it? When you drink the water Jesus gives you, you will never be thirsty forever! He is emphatically promising permanent satisfaction that will never, ever, ever be taken away from you. The permanent slaking of soul thirst. The rivers of His Spirit will richly satiate you for the entire duration of your existence. “We shall be satisfied with the goodness of your house!” The goodness of His house, His dwelling place, is luxuriously satisfying. It’s the kind of goodness that stays with you. That anchors you. That settles your soul. That permeates you. That carries you through the day. That gives you strength in any and every adversity. “We shall be satisfied with… the holiness of your temple!” Did you ever consider that holiness could be extravagantly satisfying? Yes, beloved child. Being made holy with Him who is Other will deeply satisfy your being – vastly beyond what any fleeting moment of earthly glory could do for you. Vastly. You can’t even put the two things on the same scale. Holiness is something that He Himself gives to you. You don’t earn it, you don’t work yourself up to it. You just center your everyday living in His presence, in His courts. More and more, you learn to abide in Him. The more you do so, the more the essence of who He is gets into the essence of who you are. And the deeper your satisfaction grows. “Blessed (happy, enviably fortunate, and spiritually prosperous — possessing the happiness produced by the experience of God’s favor and especially conditioned by the revelation of His grace, regardless of their outward conditions) are the pure in heart, for they shall see God!” (Matt. 5:8, AMPC). Not just momentarily happy but possessing happiness. Shaped by the revelation of His grace. And best of all… seeing God. Beholding His indescribable beauty. Gazing on His magnificent goodness. Transfixed by His infinite loveliness. Transformed by His stunning love glory. Have you had a deep draught of His living waters? 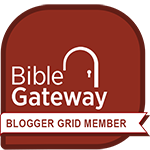 If you are longing to feast on the abundance of His house, a great place to dig deeper is biblegateway.com. Check it out for a plethora of wonderful study tools! And I am nourished by your description of them 🙂 Amen and amen, my brother! What an encouraging post. Thoughtful and challenging. Thank you, Faye! 🙂 ❤ Love always! Top of the afternoon to you dear! There is always a quiet satisfaction in knowing that whatever else may happen in our lives, we have the constant, quiet peace and contentment of God’s presence. 😊 Thanks for the reminder, Jennifer.